Product #5809 | SKU C430 | 0.0 (no ratings yet) Thanks for your rating! 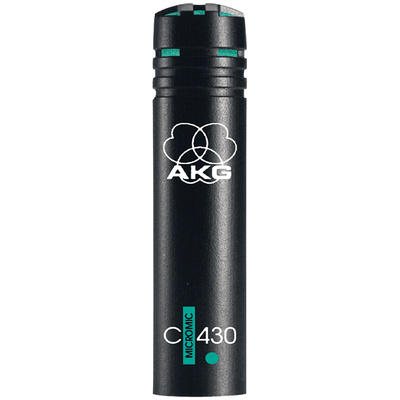 The C430 Professional Miniature Condenser Microphone from AKG is designed for use as a cymbal and overhead microphone for drums. The miniature condenser yields a high-quality frequency response, enabling the microphone to handle a variety of applications. The cardioid polar pattern limits off-axis signal, allowing for use in noisy environments and where monitor speakers may cause feedback. The microphone's AEQ curves accentuate the frequency range of cymbals, and the compact, lightweight design provides portability and easy mounting. The C430 offers a frequency and signal response designed for cymbal and drum overhead capturing. The microphone accepts 9 to 52V from either a battery or phantom power source. A strong, compact design offers portability and durability.